Form: The catacombs were a series of underground tunnels dug into the soft volcanic rock beneath Rome. Some of the tunnels were connected as an overall network system. The small spaces were most often used as tombs in which the bodies were kept in crypts and in niches carved directly into the rock. 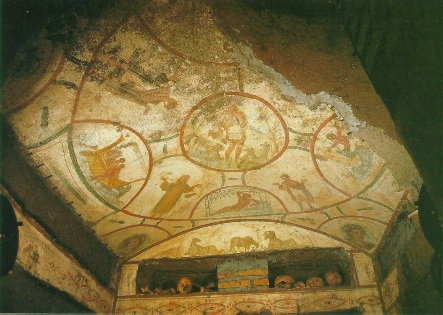 The cells or rooms for these tombs were often decorated with frescoes although in terms of the illusionistic and over all quality of the frescoes were not as fine as those found in Pompeii.This particular fresco is on the ceiling of one of the chambers. It is a symmetrical design that fits the contours of the ceiling. The over all shape is a medallion (circular form) which contains another circle. Radiating from the inner circle is a cruciform (cross like) design that terminates in lunettes (small half circles). Each of the empty spaces contained by the design hold a scene or a figure. 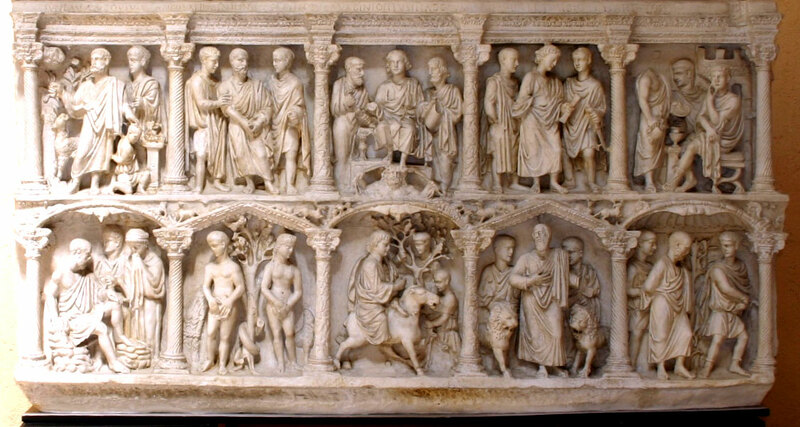 The figures all stand the orant pose but those inside the half circles and the central circle contain slightly different scenes. 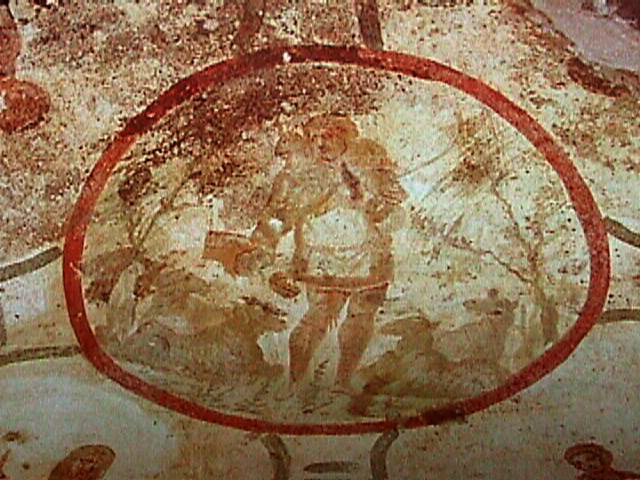 The central circle contains a naturalistically rendered image of a figure standing in contrapposto pose. His over all pose follows the schema of the sculpture of the Moscophoros. The surrounding lunettes show scenes from the story of Jonah and the Whale. Context: Stokstad has an excellent description of the context that these frescoes would have been found in on page 293. Bishops become priests and cardinals are important bishops that elect pope.